Alongside the pasty, clotted cream is probably the food most usually connected with Cornwall. 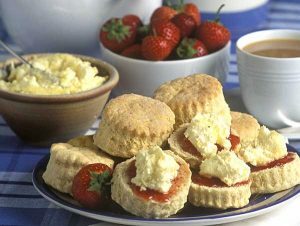 Although Cornish clotted cream is now sold in supermarkets all over Britain, a cream tea remains the special delight for Cornwall’s many summer visitors and Cornish clotted cream teas are served to airline passengers as they fly around the world. These days, under European Union regulation, only clotted cream made in Cornwall can be sold as ‘Cornish’, and Cornish clotted cream is the product of a special set of circumstances. Plenty of rain and mild temperatures combine to produce lush fields of grass that allow cows to produce rich creamy milk. A high level of carotene in the grass contributes to the distinctive yellow colour of Cornish clotted cream. The art of making clotted cream goes back centuries and both Devon and Cornwall lay claim to its origin. The only other place where it is traditionally made is the Lebanon and it is thought it might have been taken there by Phoenician traders who came to Cornwall to trade for tin in around 500BC. 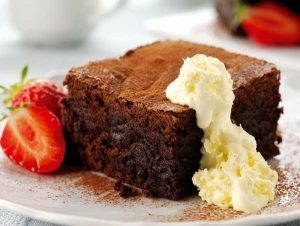 It takes six pints of fresh milk to make half a pound of clotted cream. Traditionally the milk was left to stand in a shallow pan for twelve hours or so, until the cream rose to the surface. The pan was then heated very slowly until a thick creamy crust formed on the top and when it had cooled this was spooned off ready to eat. It used to be a common sight in the farmhouse kitchen to see a large bowl of cream gently cooking on the stove, and visitors would be offered golden crusted cream on newly baked scones or splits. Today the process is mechanised and there are a number of dairies in Cornwall making clotted cream. The oldest is Roddas at Scorrier which has been making clotted cream for over 120 years. Thomas Rodda started producing cream from his small herd of cows in 1890 to sell in local markets. In the 1920s the family started sending cream by train to customers in London like Fortnum and Mason. When demand outstripped what their own cows could produce, spare milk was collected from nearby farms by bicycle and motorbike. Today a fleet of road tankers collects milk from local farms and delivers it to the creamery. This website has been set up by the Cornwall and Farming Group with the invaluable assistance of members of the teaching profession.